FAQ | Products | Tenrehte Technologies, Inc. I turn my electronic devices off when they are not being used, how am I wasting energy? In many cases, our electronic devices are invisibly consuming power all the time, even though we may only be using them a few hours a day. Sure enough, almost all of our electronic devices have a power switch. And when switched off, why shouldn't you believe the device is off? In fact, you might even hear the satisfying click of an internal relay or switch when you turn off your electronic devices. In reality the unit is still powered on, internally wasting electricity and running up your electric bill. According to the studies performed by ENERGY STAR, a joint program of the U.S. Environmental Protection Agency and the U.S. Department of Energy, 40% of all electricity used to power home electronics is consumed while the products are turned off. By continually monitoring your devices, PICOwatt® shows you how much energy is being wasted when a unit is supposed to be switched off. Just what is 'standby power' or 'vampire power'? Standby power, also called vampire power, phantom load, or leaking electricity, refers to the electric power consumed by electric or electronic devices while they are switched off, enter sleep mode, or are in standby mode. Standby power is the base level of power consumed by electronic appliances when they are waiting to be used. It is one of the ways in which we waste significant energy at the plug, and PICOwatt® helps you identify standby power. How does energy waste affect me or my business? For starters, the more energy you use, the more you pay when your utility bill arrives. Since wasted energy is included in your electric utility bill, you are spending (wasting) money on energy with zero benefit to you. While it is true that electricity rates are rising year after year, utility bills are rising faster due to more and more electronic devices entering into every facet of our lives. Using PICOwatt® to eliminate energy waste will reduce your utility bills. In addition, energy waste results in higher-than-necessary demands on the electric utility grid which equates to increased carbon emissions which we can all do our part in reducing. How much energy do electronic devices actually use? Every day electronic devices make up a surprisingly high share of home and office energy use today, and according to studies performed by the International Energy Agency the energy consumed by information and communications technologies as well as consumer electronics will double by 2022 and increase threefold by 2030. Depending on your specific situation, your energy use may be higher or lower than your neighbor, however it is clear that electronic devices are the fastest-growing energy load in homes and offices. PICOwatt® helps you identify energy loads and take action to eliminate energy waste today! How much energy can I save with the PICOwatt®? Where can I purchase PICOwatt®? The simplest way to purchase a small number of units is by placing your order through our web store. If you are a commercial customer, or want to purchase products with help from a Tenrehte expert, please contact us by sending an email to sales at tenrehte dot com. Many energy-saving products have long payback periods associated with them. Is this the case with PICOwatt® too? How does PICOwatt® save energy? 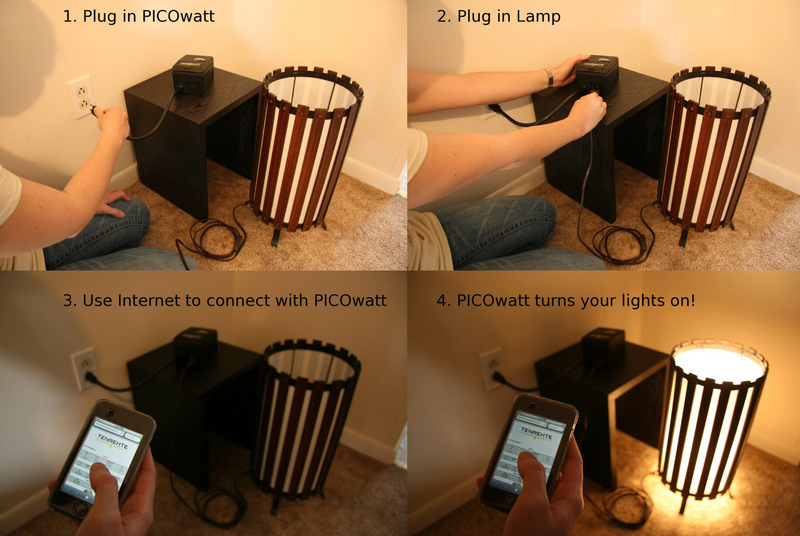 PICOwatt® automatically turns off your electronic devices for you based on timers you set based on our daily routine. No more worrying that your mode entertainment system was left on all day or having to remember to turn off electronic devices in standby mode. Just set it and forget it. What is required to use PICOwatt®? Can I use PICOwatt® in my home? How many PICOwatt® units do I need for my home? You can start saving with just one PICOwatt® and can add as many as you need for all of your energy wasting devices. Use your first PICOwatt® to audit your electronic devices for opportunities to eliminate wasted energy. 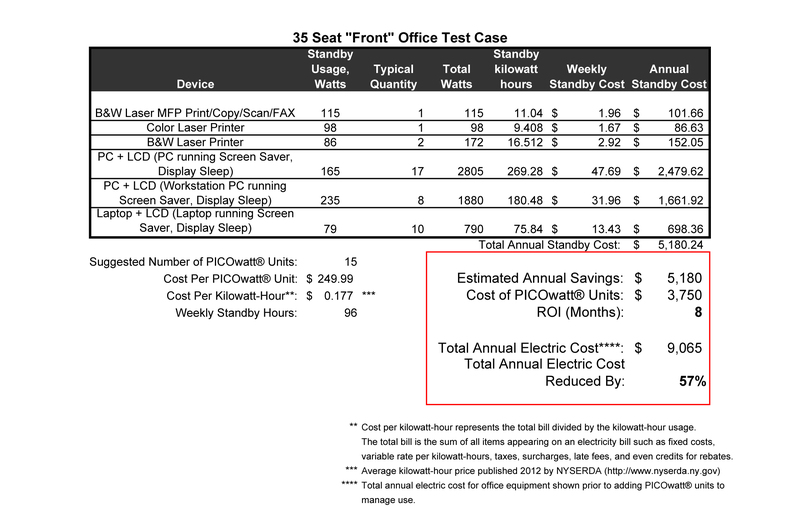 How many electronic devices can PICOwatt® manage? In areas with 120 Volts AC, PICOwatt® is rated for 15 amps and can monitor and control multiple electronic devices. In areas with 240 volts AC, PICOwatt® is rated for 10 amps and can monitor and control multiple electronic devices. You may choose to plug a power strip into your PICOwatt® if you're already using one. No. Each PICOwatt® network is secure so that only you can view your energy consumption and savings. What is the timer feature and how does it work? Through web application built into each PICOwatt®, you can set timers to schedule when your devices turn on and off. Just select when you want your devices to be on and off each day, set it and forget it. How do I override a timer? If you come home from work early and want to turn on your entertainment system, simply access your PICOwatt® using a web enabled smart phone, tablet or computer and access the ON|OFF tab. Once finished, access the ON|OFF tab again to disable the override and the PICOwatt® will immediately go back to following timers as scheduled. Does PICOwatt® require a computer to function properly? Absolutely not! Unlike many other electric energy management and efficiency products, PICOwatt® is a self contained Smart Plug that includes built-in memory which permanently stores all settings, timers, and energy data. In fact, PICOwatt® has enough memory to store at least 50 years of energy data, and therefore PICOwatt® is the Energy Odometer™ for your electronic devices. Obviously since PICOwatt® does not require a computer to manage and control your electronic devices, PICOwatt® saves you even more money on your electric utility bill. Does PICOwatt® protect my electronic devices? 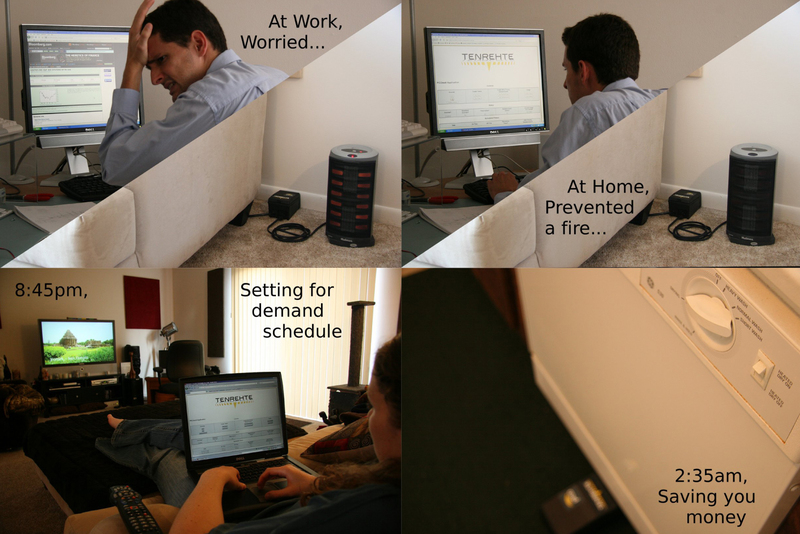 Yes, PICOwatt® helps protect your electronic devices! PICOwatt® has built-in surge protection, and will automatically shut off power to attached devices when the PICOwatt® senses a prolonged spike in power. PICOwatt® will also gently turn off and on power to attached devices significantly enhancing the life of components in your electronic devices by minimizing power surges. Can I control my devices remotely? Can I use PICOwatt® at my business? How many PICOwatt® units do I need for my business? How many PICOwatt® units can be installed at one location? PICOwatt® uses Wi-Fi to connect to your local area network (LAN), therefore the number of PICOwatt® units is only limited by how many Wi-Fi devices your wireless network can support. Where is my energy data stored? PICOwatt® is a self contained Smart Plug that includes built-in memory which permanently stores all settings, timers, and energy data. In fact, PICOwatt® has enough memory to store at least 50 years of energy data, and therefore PICOwatt® is the Energy Odometer™ for your electronic devices. Can I access my PICOwatt® from a remote location such as my smart phone? Can PICOwatt® be used anywhere in the world? Yes! PICOwatt® is designed to be used world wide. The PICOwatt® case utilizes an IEC standard power inlet / outlet connector. The supplied region specific power cords plug into this connector allowing use where you live without power adapters. If you have any questions about using PICOwatt® where you live, please contact us by sending an email to sales at tenrehte dot com. How much power can PICOwatt® control? The PICOwatt® base unit, without power cords, is rated for 100-240 Volts AC, 50-60 Hertz, 15 Amps. These ratings allow the PICOwatt® base unit to be used anywhere in the world. Please note that region specific requirements will reduce the amount of power PICOwatt® can control. For example, in regions with 120 Volts AC, PICOwatt® is rated for 15 amps. In regions with 240 volts AC, PICOwatt® is rated for 10 amps. You may choose to plug a power strip into your PICOwatt® if you're already using one. For added safety, PICOwatt® includes a fuse which limits the maximum current draw based on your location. If you have any questions about using PICOwatt® where you live, please contact us by sending an email to sales at tenrehte dot com. Haven't energy monitors have been around for years? Sure there have been energy monitors for quite some time - your electric meter is an energy monitor. But PICOwatt® is much different - PICOwatt® helps you decide which electronic equipment you can turn off or regulate by collecting and presenting you with the data you need to make smart energy decisions. Since PICOwatt® keeps a history of your energy use, you can review and refine usage as necessary to optimize your energy consumption. For example, PICOwatt® reports electronic devices which are invisibly consuming power all the time, even though you may be using them only a few hours a day. Or you may discover you can set a schedule for PICOwatt® to run you equipment at set times of the day if 24 hour use is unnecessary. Automatic load reduction with intelligent sensors and switches from our PICOwatt® product line dramatically increases the strength of our Grid and provides a better chance for renewable energy sources to be effectively integrated. PICOwatt® and PICO™ Technology enables existing network infrastructure to allow for many distributed feed-in points at the transmission-level. Rapid fluctuations in distributed generation, such as due to cloudy or gusty weather, present significant challenges to power engineers who need to ensure stable power levels through varying the output of the more controllable generators such as gas turbines and hydroelectric generators. PICOwatt® and PICO™ Technology is a bridge technology to enable improved flexibility and sustainability for energy consumers.